Set the mood with our Uplighting Services that turns an ordinary room into an amazing elegant setting and creates a magical moment that your guests will always remember. Select color tones that match your color scheme. Uplighting is a technique used in lighting design to enhance the atmosphere in any given place and involves placing light fixtures on the ground facing them upward onto a wall and on objects. It adds color and elegance to your event space and can make your event space appear taller by accenting vertical lines and creating new ones. LED Lighting fixtures have become the industry standard for safe, close proximity lighting applications. Minimal heat output with deep saturated colors, durable and low energy draw. Uplighting is Economical and Eco-Friendly! The perfect decoration to enhance your theme! Uplighting can add impact to your event without emptying your wallet. Create the look you want by washing any wall / Ceiling in the static color or timed rolling color fade or your choice. Accent any wall, corner, column, plant or alcove in the color you desire. Enhance your wedding theme by having each table warmly glow in your color scheme. 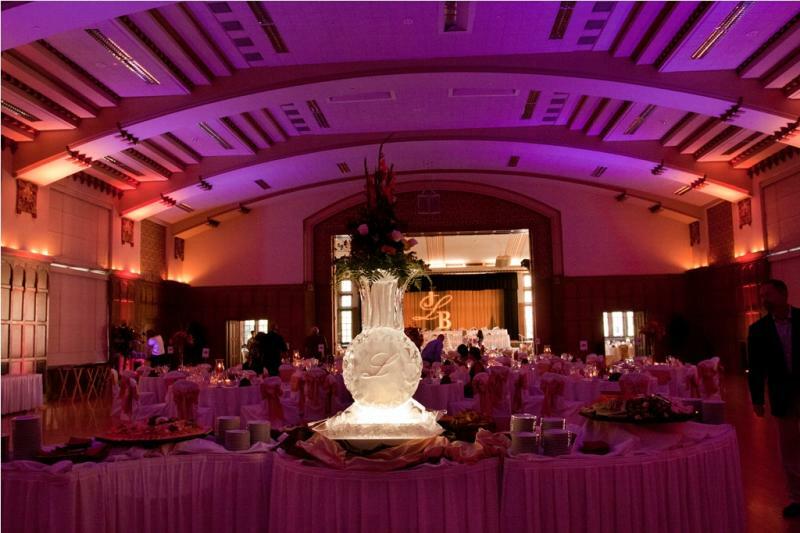 A gobo monogram provides the “wow” factor at your wedding or event. Imagine your guests entering your ballroom to see your initials or logo displayed in bright light on the dance floor or wall. Custom designed Business Logo's can also be made for your company. Because of the knowledge and expertise required to design, produce and setup a gobo monogram they are not all that common to weddings and special events. Our company has this knowledge and expertise to help you with your gobo and can assist you with the right gobo for your event. We can project your names, date, message, company logo, or other relevant information onto the dance floor, on a screen, or on a wall. Sometimes called a “gobo projection” or “dance floor monogram”, we have multiple options to fit your style and/or budget. 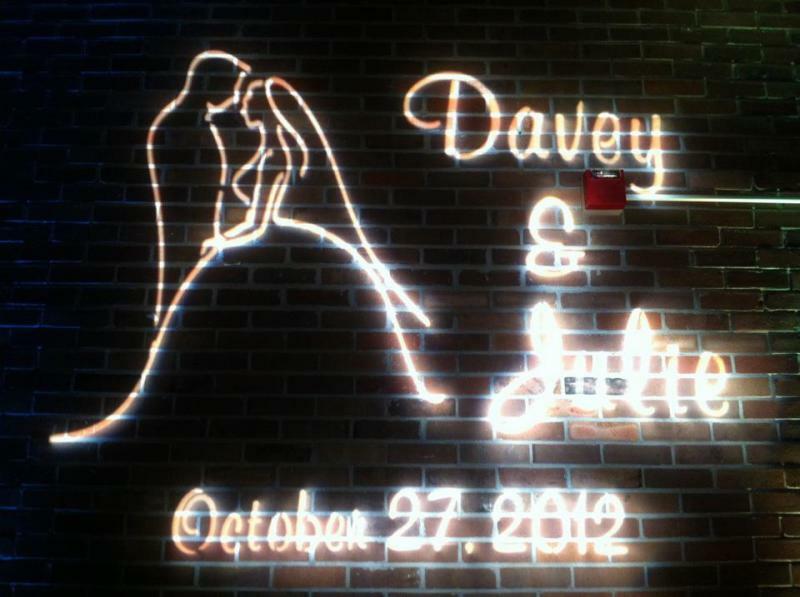 All gobo projection packages also include Gobo Design Services at no charge. 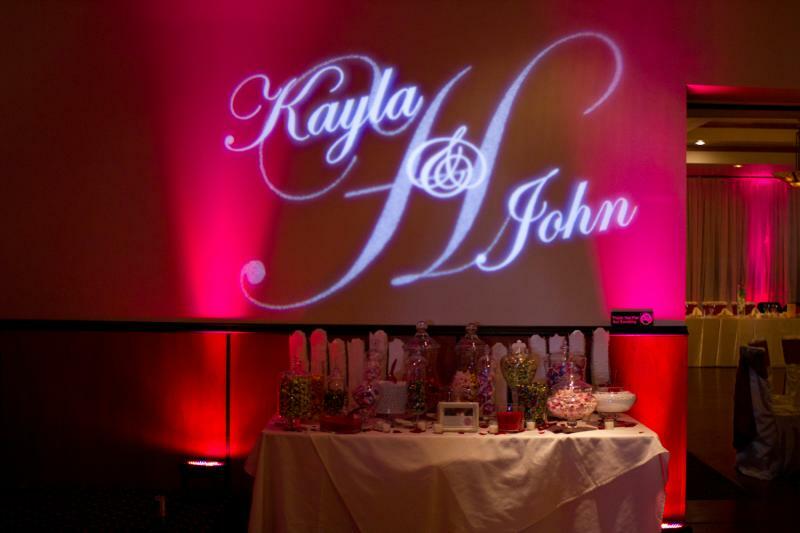 Let our Professional Uplighting & Monogram Logo services add beauty and stimulation to your event giving your guests another reason to compliment your sophisticated event tastes.